Trump Tweets America Recognizes Israel's Sovereignty Over Golan, The World Reacts. The left is upset, Trump just announced with a tweet yesterday that he was recognizing Golan Heights as part of Sovereign Israel, this is quickly generating cries from much of the world, along with many from the left. I say about time Mr. President, Israel is under no obligation under International Law to either hand it back or vacate the area. The reason for this is rather simple, Israel and Syria are still in a state of war, have been since 1948, there has not been a peace treaty signed between the two sides, technically they have been at war for 71 years and counting. This comes from the Syrian refusal to recognize Israel, they have not since Israel was created out of the Mandate of Palestine, something rather interesting since they to were reformed out of the Mandate of Syria, but as we see quite often the Arab Nations over there demand what they refuse to give. I heard yesterday people claiming the only reason Israel has annexed the Golan Heights is there have been large quantities of oil deposits found under it, but that is not true if you look at the date of Israel annexing the area (14 December 1981), oil in the Golan was not even discovered until 2015, turns out making this claim ignores the reality of history, the discovery came 34 years after Israel effectively annexed the area. So let’s dig into history, look at how Syria came into possession of the area. It turns out the first thing both nations did was violate the Mandate, started to switch lands without any consultation of the people the lands were being set up for. The reason for this was simple, neither France nor England had any interest in setting up self-rule, they figured they were given the right, as they had done as a colonial power for years prior, to set up provinces in the land, yet was now part of that empire. 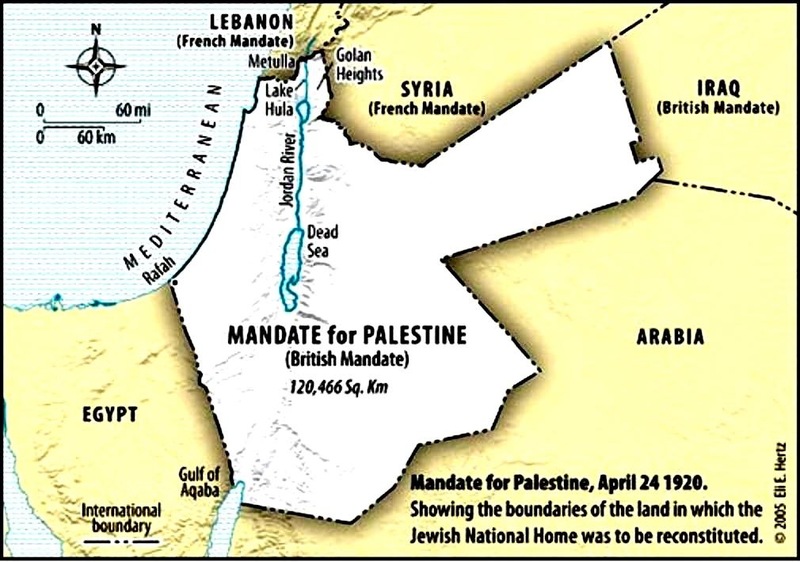 England was so bad they promised parts of the Mandate of Palestine to many parties, many times the same exact area to more than one, just to aid in their quest to defeat Germany as they entered WW2. Why the Mandates were set up was after the Ottoman conquest of the areas in the 1500’s they had never given them self-rule, it was figured the powers to be, France and Britain could aid in setting up the transition from being a territory to a nation, but what happened had nothing to do with aiding this, it was all about appeasing the population. The problems with dispute over the land was the Mandates were very vague on the borders there, also, one has to remember, in the 50 cease-fire lines Syria demanded the right to stay in control of the land it had conquered, then in ’67 said this was not fair, they demanded to continue to control the land they had conquered in ’48, but now demanded that Israel could not do the same. It was after the war that the UN decided to act, this was after Israel had soundly defeated the combined Arab armies, then while ignoring international law the UN passed Resolution 242 (1967), demanding Israel withdraw from territories it had come into possession of, yet ignored international law that states until a peace treaty is signed, no movement will happen, unless voluntary. As for the law, this is a verbal law, the Geneva Convention protocols say nothing about if a nation goes to war with you with the intent to wipe you out, you are required to give back the land, this is why I question the whole claim that with the Golan Heights Israel is violating international law. Isn’t it amazing how the “Palestinians” say they had no claim to the land in 1964, then in 1968 suddenly they as if by magic found their historical claim to the land, I must ask, what happened in between those two times? Could it be the ’67 war? I know history well, have to say, this is the only time in my life with all my years of study I have heard of a historical claim change according to who is controlling the land. In the end, we have to look at what Trump has done with the Golan Heights, I love how Russia is condemning this, yet they went into Crimea without hostilities directed at them and took that land, seems they are being rather hypocritical. And don’t get me started with Europe or China, can we say Mongolia, Tibet? Is it OK for world powers to change the laws as it suits them, but when dealing with Israel and the Golan Heights they demand that Israel abide by laws they made up? This land is Israeli land; you can see that in the ruins of Synagogues from the Judea time in Golan, it was the land that the tribes of Dan and Manasseh, it was part of the Jewish empire until the time of the Roman destruction of the state. Claiming this was part of Syria is nothing but nonsense, there, like Israel, was no Syria in existence in 1918, it was part of the Ottoman Empire, it was a territory, just like Israel was. The Golan was part of Israel in ancient days, it is now part of Israel now! NextIt Is Time To Call This Mueller Investigation What It IS, TREASON!